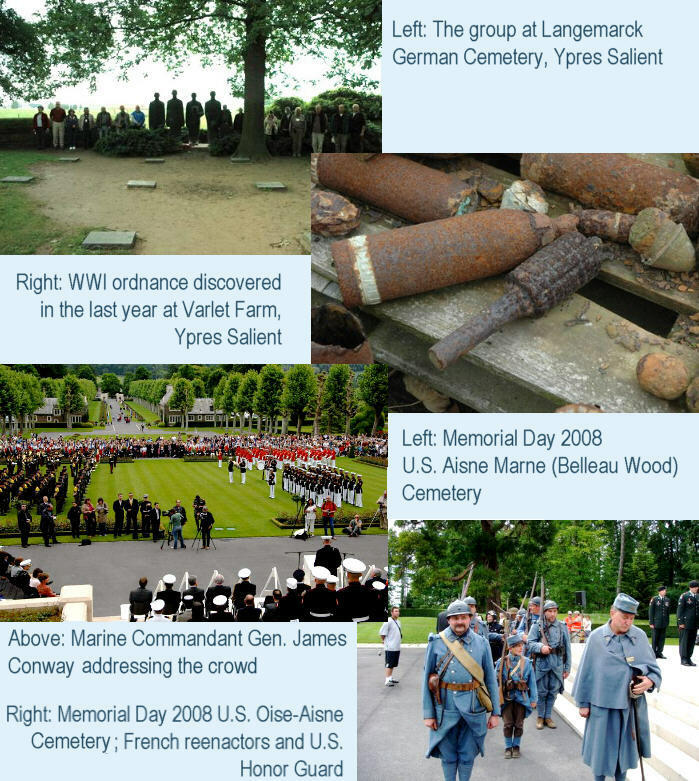 The Allied successes in reducing the Marne Salient and of the advance before Amiens led to a reevaluation of the possibility of ending the war in 1918. Much strategic thinking to this point had been guided by the fact that the second wave of 2 million American troops would not be in place until April 1919. Generalissimo Ferdinand Foch was an advocate for a broad advance to push the German army back across the Rhine. A critical part of his plan would be executed by a brand new American Army, under Pershing's command, which was just organized in August. 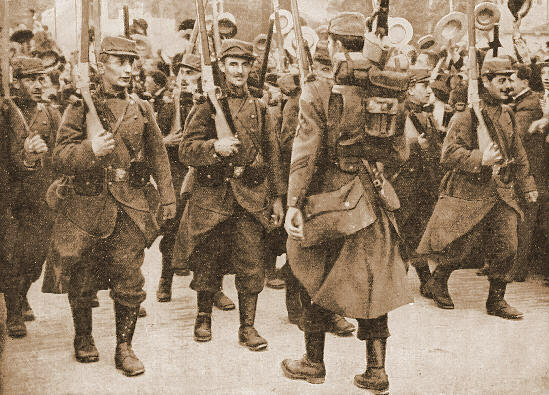 After extensive negotiations, it was agreed that in a preliminary operation, this U.S. First Army would be given the job of reducing the St. Mihiel Salient which had threatened Verdun and the Allies' east-west rail communications for four years. 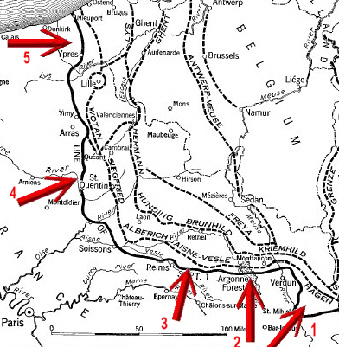 Then, two weeks later they would shift their forces west for another offensive on the old Verdun battlefields. In this position they anchored the right end of a broad group of Allied offensives extending from the Channel, through the Somme sector and over through the Champagne to the immediate left flank of the Americans. The coordinated assault would--in Foch's thinking--prevent Ludendorff from shifting reenforcements from hot spot to hot spot. Also, each of the individual operations had the potential for a dramatic breakthrough similar to what had happened in August at the opening of the Amiens attack. Such a breakthrough was not to be repeated in any of the sectors, but the strategy was sufficient to pressure Germany to seek terms in less than two months. Fr. IV Army, Launched 26 Sept. This is a first-class and long overdue study of the opening battles of World War I on the Western Front and the armies that fought them. It is also the first book in English on the Battle of the Frontiers fought in the Ardennes. Perhaps the most valuable part of this analysis is contained in the first two chapters in which Dr. Zuber examines the very different doctrine and training methods used by Germany and France. Not surprisingly, he finds German doctrine, tactical training and staff leadership vastly superior to the often slapdash French system. Specifically, the Battle of the Frontiers proved the superiority of German battle tactics and frontline leadership, as well as superior understanding of the importance of reconnaissance despite the frequent breakdowns of command and control at the divisional and corps level. The Germans emphasized patrols at all tactical levels and in all arms. While the French focused on maneuver, the Germans sought battlefield superiority through movement and firepower, including the use of their powerful, high angle-of-fire howitzer. Unlike the rigid French Army system of detailed written orders, Germany stressed flexibility and initiative among company and platoon commanders and even NCOs. These habits of command were reinforced by frequent peacetime field exercises at all levels of command. By comparison, French prewar training regimes were uneven and irregular. Moreover, the Battle of the Frontiers did not prove the efficacy of either the German or French battle plans. Since prewar plans were not executed by either side, victory was the result of small unit successes based on superior German tactics and training. Also, the author contends, French defeat in the first battles of 1914 could not be laid at the feet of Grandmaison and his theories of offense á outrance, which were adopted too late to influence French 1914 tactics. This book is thankfully full of those clear, useful maps often missing from military histories. The author made great use of German primary sources, including war diaries, as well as more limited and often fragmentary French sources. By 1914, as the author asserts, the German Army had reached its pinnacle, having learned to fight outnumbered and win even in the difficult terrain of the Ardennes. Therefore, it is fitting that this monograph concentrates on its operations. 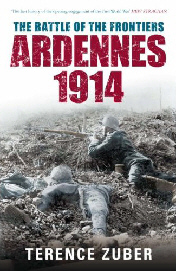 The Battle of the Frontiers, Ardennes 1914, Terence Zuber, Tempus, 2007, 314 pages, maps, photos, schematic sketches, orders of battle, end notes, glossary, ISBN 978 0 7524 4424 6, $34.96 cloth. Dr. Zuber is a retired U.S. Army Major and the author of Inventing the Schlieffen Plan: German War Planning 1871-1914 (Oxford 2002) and German War Planning 1891-1914: Sources and Interpretations (Boydell & Brewer, 2004). This past August the Turner Classic Movies channel aired some rarely seen pre-code Barbara Stanwyck movies. Of special interest was Ever in My Heart (1933) directed by Archie Mayo and written by Bertram Millhauser and Beulah Marie Dix. In just 70 minutes, Ever in My Heart tells the story of Mary Archer's (Barbara Stanwyck) marriage to Hugo Wilbrandt (Otto Kruger) in pre-World War One New England and the subsequent events that destroy their happiness. I had never seen or even heard of Ever in My Heart prior to this airing and I was completely surprised by its pace, its pre-code frankness and its explicit condemnation of a xenophobic America. Mary Archer is expected to marry her cousin Jeff (Ralph Bellamy) when he returns from studying in Europe. Instead she falls in love with Hugo, a university friend who has accompanied him back to Archerville in New England. Hugo woos her by playing "Du, Du Liegst Mir im Herzen" on the family piano. Her family opposes her marriage to a foreigner, but the couple proceeds anyway. Hugo gets a position as a college chemistry professor and the young couple is very happy with Teddy, their young son (Ronnie Cosby) and the family dog, a dachshund. Hugo becomes an American citizen, and during the ensuing celebration, a variety of songs are sung by the party guests indicating their national origins: "(I Wish I Was in) Dixie," "La Marseillaise," "Rule Britannia," "Yankee Doodle," "A Stein Song" and "Auld Lang Syne". There's no mistaking that Hugo is loved by his fellow faculty members and adored by his wife and young son. But the morning newspaper headline proclaims that Germany has invaded Belgium, and there's nothing but misery ahead for Mary and Hugo. The sinking of the Lusitania places further strains on the family. Dismissed from his job, Hugo is snubbed by the community. Teddy dies (in a very moving scene while Hugo sings to him), some neighborhood children brutally stone the dachshund and Hugo is forced to shoot him. When they are nearly destitute during the winter, Mary's grandmother offers Hugo a job in the family mill if he will change his name. Hugo refuses but sends Mary off to her family, saying he will join her later. Just before Christmas Mary receives a letter from Hugo. He writes, "They let me be a citizen, but they won't let me be an American." Hugo abandons Mary and returns to Germany. After America enters the war, Mary, Jeff and her younger brother Sam (Frank Albertson) all do their bit. Mary goes to Europe and while working in a canteen sees Hugo dressed as an American soldier. He's actually the spy that Jeff is looking for. Mary hides Hugo in her room and after making love for the last time she poisons their wine and they die together. The Rainbow Division is saved, and Mary and Hugo are gone. Ever in My Heart received decidedly mixed reviews 75 years ago. For example, The New York Times felt that it "dipped into the limbo of forgotten war scenarios." And that "the tragedy is meaningless to this new generation." 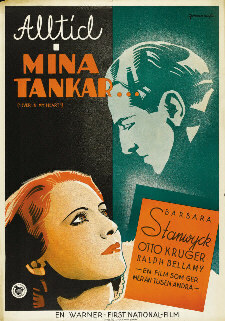 But it praised "the warm and intelligent acting of Barbara Stanwyck and Otto Kruger." This was Stanwyck's 16th film and her first truly tragic role. Kruger would play another German spy in Hitchcock's Saboteur (1942). I feel that any movie prescient enough to portray a xenophobic American society prior to the 1942 internment of Japanese-Americans and the harassment of Muslim-Americans in today's post-9/11 society deserves to be re-examined. Unfortunately, Ever In My Heart is not available on DVD, so Turner Classic Movies channel is its only venue at the moment. It is not in frequent rotation, so if you're interested in seeing it you'll need to follow the TCM channel listings. It's worth the search. The following are thanked for their contributions to this issue of the Trip-Wire: Christina Holstein, Tom Jones, Tony Langley Andrew Melomet, Ray Morrisette, Tony Noyes, Bradley Omanson, John Shetler, Len Shurtleff, and Kimball Worcester. Until next month, your editor, Mike Hanlon.